Jacaranda – Pride of Pretoria – first published in 1997 as Jacaranda – Splendour of Pretoria – celebrates the breathtaking beauty of South Africa’s capital city in jacaranda time. The author has skillfully combined factual information on how Pretoria came to be the Jacaranda City and the botanical description of the splendid tree, with lyrical prose and poetry reflecting the effect of the glorious jacarandas on the citizens of and visitors to the City of Tshwane Metropolitan Municipality. The text is interspersed with beautiful photographs that capture the enchanting transformation of the city in October and November each year. In addition, the book provides a choice of jacaranda routes around Pretoira, described in words and maps. Jacaranda – The Pride of Pretoria – is an indispensable guide for visitors to the capital city in October and November, and a must for all who call the Jacaranda City their home. As a gift to Pretorians living abroad it will evoke nostalgic memories and the urge to heed that long-felt call to come home that cannot be ignored. 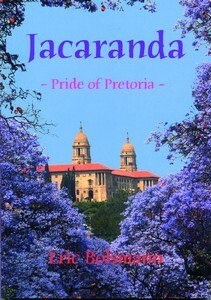 Jacaranda – Pride of Pretoria – was published by Be My Guest Publishers in?Pretoria as 40-page, soft cover book in the gift-book genre in 1997. The book is available from be My Guest Publishers at R70,00, incl. Vat and postage in South Africa.